Before the shock of Japan's devastating earthquake, the world was in disbelief in February when New Zealand's second largest city, Christchurch, bore the brunt of an unusually shallow 6.3-magnitude tremor that left swaths of the downtown and eastern suburbs uninhabitable and caused numerous casualties. While our thoughts go out to those people who have lost loved ones, homes and businesses, travel bloggers around the world are uniting to tell the world New Zealand is a great place to travel and there is no better time than now. Blog4NZ is a grassroots blogging and social media effort to support New Zealand travel in the wake of the Christchurch earthquake. 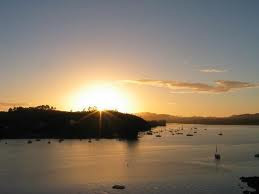 Busby Manor is nestled near Paihia Beach. Located in the heart of the Bay of Islands (see photo at left), this area boasts more than 150 bush-clad sandy-beached islands, which with their unspoiled beauty, are a mariner's dream. The whole region is steeped in history, boating, and fishing. Visit the Kelly Tarlton Shipwreck Museum, or the famous Treaty House, where in 1840, the Treaty of Waitangi was signed. For the golfer, experience breathtaking views from each of the nearby course's 18 holes. Located in central North Island, the Taupo Ika Nui resort is situated on the shores of Lake Taupo (see photo top right), New Zealand's largest lake. As a backdrop, the mountain ranges of Tongariro National Park, Ruapehu, Ngauruhoe, and Kaimanawa add beauty and skiing availability to the area Remember that as the U.S. moves into summer, the winter ski season in New Zealand is just getting started. The region also offers many other activities, including golf, tennis, fishing, boating, and hunting. 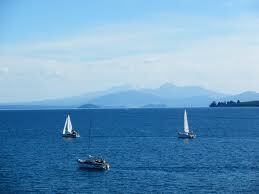 For the more adventurous try whitewater rafting, windsurfing, and waterskiing.